SmartContact is an automated patient engagement solution that uncovers wellbeing and service issues in patients sent home after an outpatient encounter (e.g., emergency department, urgent care, or same day surgery). The system was designed by a practicing emergency physician (watch his video) and deemed an Innovation of the Year in 2014 (overall) and 2017 (provider shift report). It has been demonstrated to improve departments from average to high satisfaction scores. Click here to send yourself a SmartContact demo survey. With urgent issues, built-in alerts immediately notify staff. 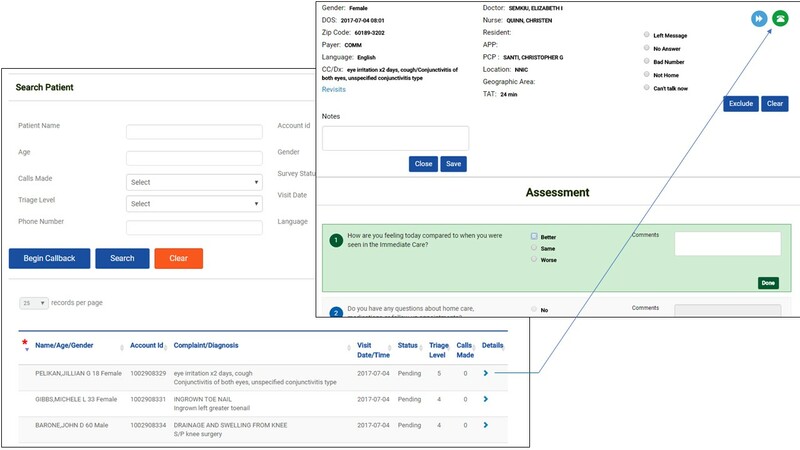 Non-urgent issues are populated in the Active Issues Manager (AIM™) allowing your team to send a patient response in an average of 15 seconds. A virtual call center can be used to contact patients telephone. With scripted questions and automated alerts, the callback staff require no formal medical training. A shift summary is pushed to providers two days after each shift and includes performance metrics and patient comments. Monthly reports provide medical directors the metrics required to drive improvement.